A lot of the businesses we work with come to us because their current delivery routing software isn’t cutting it. Others have been making deliveries without a software and simply determining routes by hand. However, some business owners come to us because they will be incorporating delivery service into their business model for the first time and want to start off on the right foot. Many local farmers and dairy producers have a slew of regular customers who come to their shop or stand weekly for milk, butter, eggs, fruits, vegetables and other items that they can buy fresh. In general, a lot of people would prefer that their food is from local sources, but going to the grocery store is a lot easier than hitting up the local farms. This puts local farmers in a bind. They need a way to grow their reach without losing the customers they already have. That’s where offering to deliver your products right to your customers’ doors comes into play. If your business doesn’t already include delivery in its model, then this will bring about a lot of changes. You might need a website where customers can place orders, vans for delivery drivers to drive, and a delivery management software to keep track of everything. You might also need to update your licenses and insurance to ensure you’re doing everything legally and protecting your business. 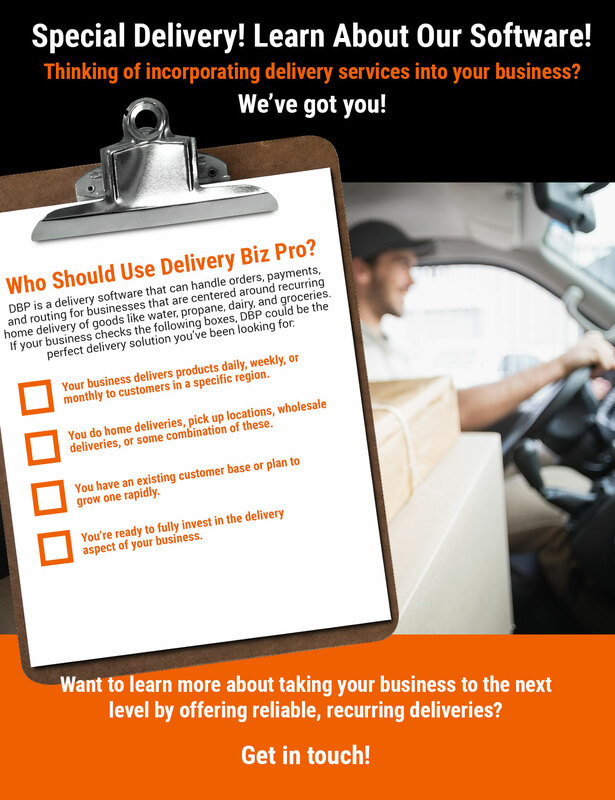 In today’s blog, we’re going over some things to consider when deciding whether or not you should add a delivery service to your existing business, as well as how the experts at Delivery Biz Pro (DBP) can help. If your competitors are already delivering their goods, then you might have no choice but to start delivering as well if you want to grow your business. You will always have those faithful customers who will drive out to your farm to purchase milk or produce, but retaining new customers can be difficult in this day and age when time and convenience are revered. More and more consumers are choosing local dairy milk over mass-produced milk they can buy at the grocery store because they like to support local businesses and know where their milk is coming from. However, there also many consumers who would rather just pick up whatever milk the store sells than have to drive to a separate location just to pick up milk. This is where offering milk delivery wins. You are able to meet the needs of the people who want locally sourced milk as well as those who don’t want to make a separate trip to buy milk. So, if your competitors are delivering and you are not, you could be missing out on a major demographic who would love your product, they just don’t want to go through a hassle to get it. When diving into delivery for the first time, it is important to set limits on how far you will deliver. What if you only have two customers for your first month and they live two hours away from each other? Making that drive every week to deliver to two people will likely cost you more than you’re making. You never know how much engagement you will get when you first get started, and sometimes it is smarter to begin with a small delivery area and expand once that section is developed. One idea to get a feel for how much interest people will show in having your product delivered to their door is to visit local farmers markets in the nearby towns or join official Facebook groups for the surrounding cities. Start reaching out to people and ask their thoughts on if they would be serious about having your products delivered to their home on a weekly or monthly basis if you happened to serve their area. If your local deliveries prove to be profitable, then start expanding further and further out, reducing the risk for a major financial setback and increasing the potential for growth. Adding a delivery option to your existing business does require some amount of investment. As an example, let’s look at dairy deliveries. Selling dairy out of a small shop requires a couple refrigerators and a way for customers to pay. Delivering dairy is a whole different ball game. You will need to use a delivery truck that has a refrigeration system. You will also need a place to leave the products, as many homeowners wouldn’t place another order if they came back to find warm, spoiled milk on their porch. This might include investing in porch coolers for customers to rent. You will also likely need to collect special insurance and licenses to have your drivers out on the road making deliveries. And of course, a software to manage all of this. This is obviously an investment, but it’s an investment that is often worth making, especially when you have the potential to grow your business from a few faithful customers who would drive an hour to get your product to hundreds or thousands of customers who would otherwise not know about your business. Before you get any of this started, you will need to establish a way for your company to keep track of delivery orders and assign routes for drivers. That’s where Delivery Biz Pro comes in. We are a full-service delivery management software dedicated to helping local businesses expand their reach and provide their customers with a quality service in addition to a quality product. We will work with you to get your business ready to add “home delivery” to its repertoire. First, you will need a website where customers can place orders, manage payments, and set recurring deliveries. This is included in our services, and our team of designers will ensure you are happy with how your website looks and performs. Then, you will need a way for those products to actually get to the customers. Our delivery management software can automatically generate routes in a way that works for your business. You can assign customers to multiple routes, create routes by drawing a circle around a particular neighborhood on a map and send different drivers along specified routes, or create routes based on the days of the week. You could have the highest-quality products for the best prices, but if you can’t get them to the right places on time, you could lose a lot of customers. Lastly, if your business model includes customers rinsing and returning their containers or renting porch coolers, you’ll need a way to keep track of this. With our produce and milk delivery software, your drivers can mark on an electronic tablet how many empty milk bottles or coolers a specific customer left on their porch for the driver to pick up. If a customer hasn’t returned a propane tank, water jug, glass bottle, cooler, or other deposit items you can have your system automatically send out reminder emails asking them to return those products. With a comprehensive and customizable delivery management system like ours, you can ensure that everything is running smoothly from the website and ordering process to the deliveries to the collection of empty containers. When you succeed, we succeed, and we’ve been here long enough to know when we’re not the right choice for a business. So, take twenty seconds and apply to use our delivery management software. We’ll figure out a time to hop on the phone with you and chat about what we can do for you. Get in touch today to get started!